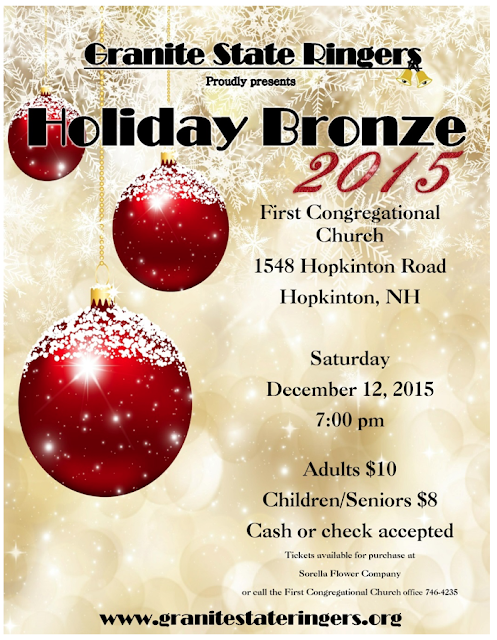 HOPKINTON, NH – December 12, 2015 – Granite State Ringers, New Hampshire's only community handbell choir, is pleased to announce an upcoming concert December 12th at 7:00pm, at First Congregational Church Hopkinton, NH, 1548 Hopkinton Rd. This event is open to the general public. Admission is $10 Adults, $8 Child/Senior. Tickets available at Sorella Flower Company or call the First Congregational Church office at 746-4235. Cash or check accepted. You may request reservations by contacting Sue Thomas at sdt1@comcast.net with subject heading of “GSR tix”. Led by director, Joan Fossum, this concert will feature a variety of holiday music including arrangements of Christmas Day, First Noel, God Rest Ye Merry Gentlemen and In the Bleak Midwinter. Granite State Ringers will also perform popular movie tunes including Believe from “The Polar Express” and Let it Go from “Frozen”. While the traditional ringing technique is always expected, the bells can also be played in a variety of other ways. Some ringers play with two bells in each hand allowing the ringer to play the bells separately or together. Bass bell ringers will often “weave” their bells. Weaving allows the ringer to play a succession of bells by changing which bell is in each hand. This season's concert will also feature an arrangement of Coventry Carol that will have the bass and battery sections of bells running a wooden dowel along the rim of the bell to achieve a unique and beautiful tone. Granite State Ringers, a non-profit organization, was formed in 2007 with the mission to offer dedicated handbell ringers the opportunity to promote and perform a varied handbell repertoire and to educate the public about handbells. Granite State Ringers performs using five octaves of MalmarkHandbells and five and a half octaves of Malmark Handchimes.